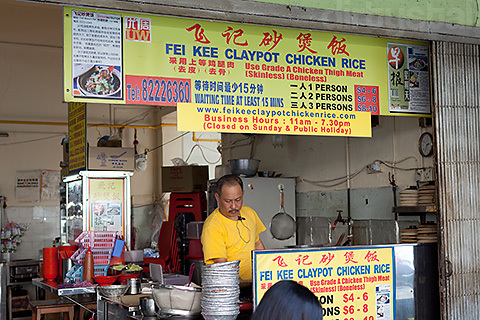 On the lookout for a place to have lunch, I chanced upon old coffeeshop at the corner of Beach Road and Aliwal Street where I saw Fei Kee Claypot Chicken Rice. I decided to try it out since the prices were pretty decent. The signboard claims that we had to wait at least 15 mins but in reality it was much faster than that. It arrived, already covered in black sauce and a load of cabbage and fried ikan bilis. I have to say that the claypot rice lacked the oomph that we normally taste in other claypot rices, my guess being that he didn’t put in the salted fish which would add that salty fragrance to the rice. He tried to compensate with the ikan bilis but it just lacked the kick for salted fish. But on the plus side, the numerous “Grade A” chunks of chicken are large, juicy and boneless so it kinda makes up for the lack of flavour in the rice. However I noticed that almost every other table was eating fish soup beehoon so I’ll probably try that next! 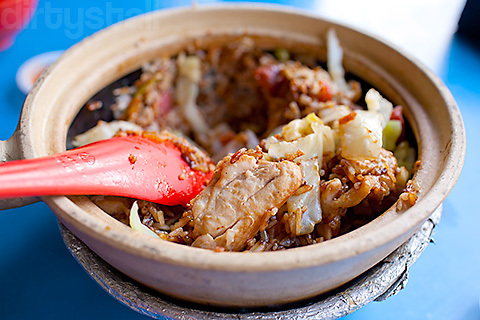 8 Responses to "Fei Kee Claypot Chicken Rice"
hey! this is just next to my workplace! Should try the fish soup cause it’s really nice! (Y) the queue is damn long most of the time though, just to take note! Haha yeah I just tried the fish soup and I’ll be blogging about it next! 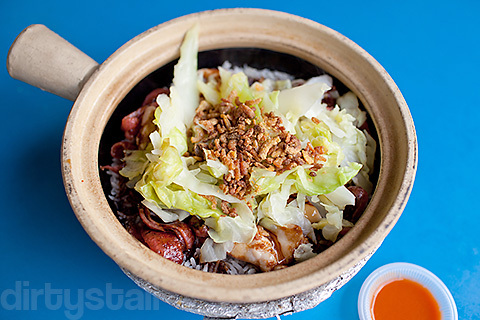 I miss the claypot rice at Commonwealth too! Are you working at bugis too? I been wanting to try this, i was told you can call and order the claypot rice then go over 10minutes later so that you will be just in time to eat. Thought that the fish soup was average. Do try the prawn mee along the beach road, 5mins away from this coffeeshop. I’m working at North Bridge Road so I’m exploring the area around here for lunch. I’ll try the prawn noodle next! Compare to others it more healthy, the fish soup I found tat is salty n fishy even dirty hahaha…. Haha I definitely can’t deny that the claypoty chicken rice is healthy!